Things are never that serene inside a Chuck E. Cheese restaurant, what with all the overstimulated children running around and all, but things got especially wild at a Chuck E. Cheese in Dearborn, Michigan, yesterday when a brawl broke out during a birthday party. It got into a confrontation where they came across at our table and a number of us were assaulted and the table flipped and I ended up underneath of that. Whoa! The grandmother, who wants to remain anonymous, was taken to the hospital and treated for her injuries. She was quite bruised up from the incident, and if they can find the man who hit her, he could be charged for assault. So far, they don't know the man's identity, but they are actively searching from him. 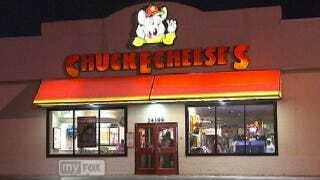 According to Fox 2, Chuck E. Cheese brawls are becoming increasingly common. It could have something to do with the fact that they serve beer to adults—and drunk adults plus crazed children does sound like a particularly potent combination that could lead to all manner of unpleasantness—but in this case, it doesn't seem that beer played any role. As grandma said, "I don't think it was alcohol-related. I think it was just their particular demeanor." Yes, it takes quite a "demeanor" to swear loudly in a kids' restaurant and punch a grandma!